For all the incredible quality Bayern Munich boast in attacking areas, a 23-year-old full-back was arguably their most consistent creative threat as the German champions thumped 10-man Besiktas 5-0 in the Champions League on Tuesday night. 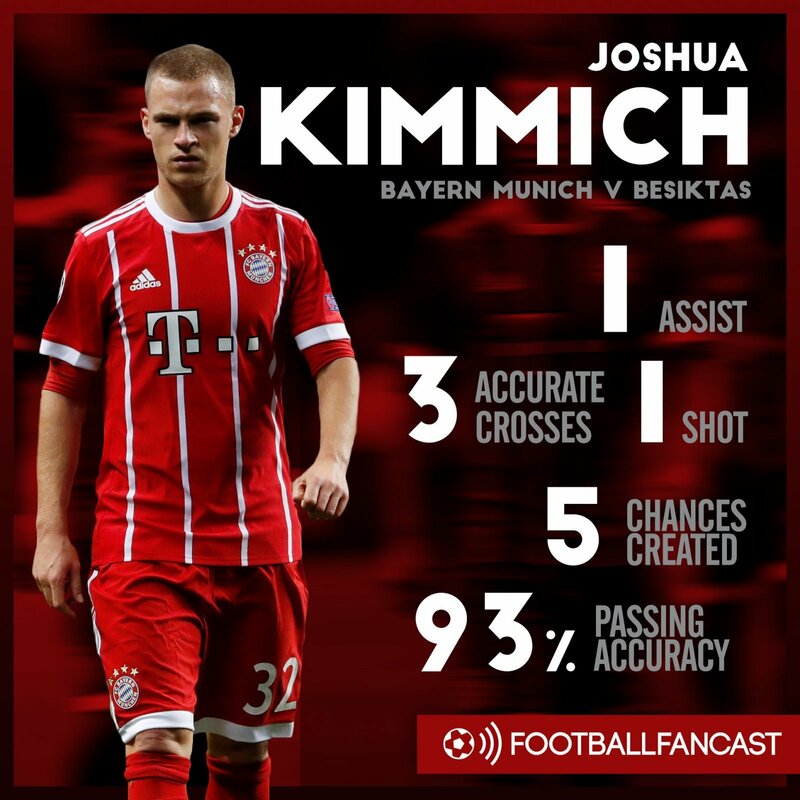 Indeed, Joshua Kimmich is an incredible prospect and he showed it once again on the European stage, creating the joint-most chances of any player on the pitch – including the assist for Thomas Muller’s second goal with a deft delivery into the near post – and providing the most accurate crosses, while completing an almost-immaculate 93% of his passes. The German international was given his chance at the Allianz Arena by Pep Guardiola, and it seems almost a crime to football that the two won’t reunite again at some point soon. During the early stages of his Bayern career, Jason Humphreys even described the youngster as the ‘perfect Guardiola player‘. In terms of where he’d fit in at Manchester City, the obvious concern is that Kyle Walker has made the right-back berth his own. But the England international requires rests just as much as any player, and current understudy Danilo just isn’t the same calibre. More pertinently, Kimmich’s qualities far extend the No.2 role. He can play in central midfield as well and has even been used at centre-half at times by Guardiola, although a 5 foot 9 frame could inhibit him more against the Premier League’s many tall and imposing centre-forwards. The prodigious youngster would be the ideal addition to City’s squad, which still requires depth in certain departments, but the Etihad outfit will have to act quickly. Transfermarkt value the 25-cap international at just £36million but Bayern will likely expect around double that – and if they agree a new contract with Kimmich in the coming months as suggested, he certainly won’t be leaving the club this summer. Manchester City need to make a move before the ‘perfect Guardiola player’ slips from their grasp.